The Rotary Club of St.Vincent will today take a contingent of local doctors, medical and other supplies to Grenada as part of this yearâs Rotary Village Doctor Programme. According to a representative from the Rotary Club at a Rotary luncheon held at the Catholic Pastoral Centre in Edinboro last Thursday the Admiral will be transformed into a floating Polyclinic that will give medical attention to any and every Grenadian who turns up. The Rotary Club will also assist in the rebuilding of the School for Children with Special Needs in Grenada. Also present at the luncheon was Austrian Gerhard Entzman and his Grenadian wife Petrina. Entzman who works for an offshore investment business that has operations in Grenada, explained that his company is currently shipping supplies to the hurricane-torn country but noted that there was a problem with distribution of the supplies. 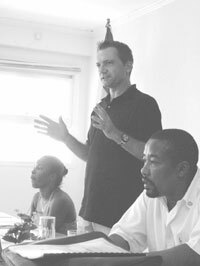 Entzman said that, in his opinion, the Government is unable to manage the situation in Grenada. âI am encouraging persons who have anything to take to Grenada to organise the distribution yourself,â said Entzman, who said that there is currently a lot of corruption going on, in that the more needy persons are not getting enough help. Entzmanâs wife Petrina said that currently, the hygiene situation is worsening with many persons reporting that they are suffering from diarrhoea. She said that what worries her most is that persons are just interested in rebuilding their houses and they are still not building them in a way that will withstand other hurricanes. Among the Rotarians who will be going to Grenada are President Dr.Colin Boyle, Communitty Service Director Francois Truchot and Chief Medical Officer Dr. St.Clair Thomas.